A 25-7 run in the first 11 minutes of the second half boosted Wabash to a 73-57 win Wednesday night over Denison University to allow Wabash to improve to 13-0 for the season and 5-0 in the North Coast Athletic Conference. The victory sets up a major showdown Saturday afternoon in Crawfordsville between the seventh-ranked Little Giants and number-one ranked Wooster (13-0, 4-0 NCAC). View photos from the Little Giants' win here and here. Senior guard Wes Smith (left) was nearly perfect from the field, connecting on 10-of-12 shots, while junior guard Aaron Zinnerman almost matched his teammate shot for shot. Zinnerman scored a career-best 15 points on 6-of-8 shooting, including 3-of-4 from 3-point range. Wabash hit its first nine shots from the field, but the Big Red answered by firing in their first four shot attempts. The Little Giants eventually stretched their lead to 11 points on a Zinnerman jumper with 13:50 remaining in the first half. Dimonde Hale and Marr Mansfield responded with eight points to trim the Wabash advantage back to three points, eventually trailing the home Little Giants by four at the break. The Little Giants shot a blistering 68 percent (15-of-22) from the field in the opening period and came out of the locker room in the second half just as hot. After two free throws from Brett Tiberi cut the lead to 37-35 in the first 15 seconds of the final period, Wabash exploded for 13 of the next 16 points scored in the game. Zinnnerman drilled a 3-pointer, followed by back-to-back treys and a layup by senior Ben Burkett to put Wabash in front 50-38. Derek Bailey, who joined Smith and Zinnerman in double-figure scoring with a season-high 12 points, added jumper to answer a basket by Alex Longi from Denison. Another Smith basket with 13 minutes left to play pushed the lead to 15 points. The Big Red would get no closer in the contest as Wabash cruised to the 16-point win. Wabash finished 25-of-51 from the field for 49 percent. Defensively the Little Giants held Denison (4-9, 1-4 NCAC) to eight second-half baskets. Hale finished with 15 points to lead the Big Red in scoring, while Tiberi tossed in 11. 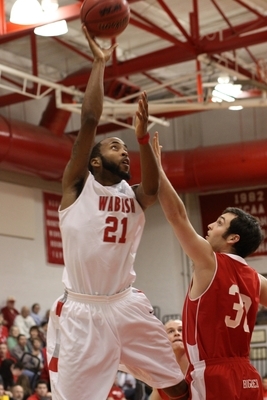 Wabash dominated the boards, outrebounding Denison 41-23. Nick Curosh grabbed a career-best 11 boards to pace the Little Giants. Zinnerman (right) had four assists to lead Wabash in that category. 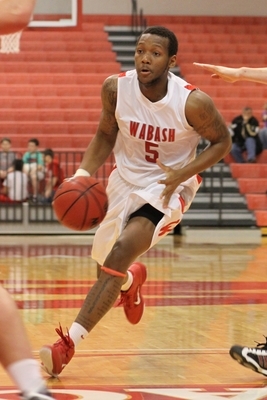 Saturday's game between Wabash and Wooster will tipoff at 2 p.m. at Chadwick Court.